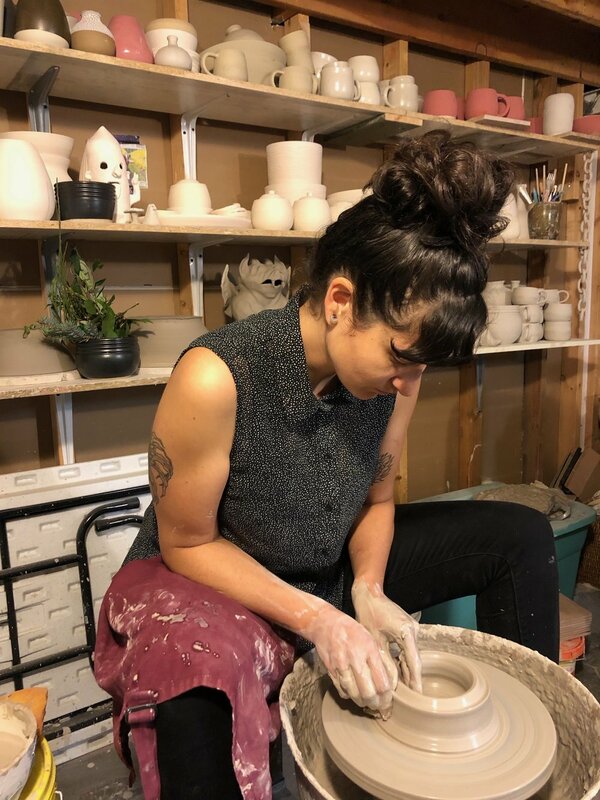 My name is Madelaine Mongey and I am a potter based in Vancouver, B.C. I create wheel thrown tableware such as vases, bowls, and cups to name a few items. When designing my wares I focus on the subtle details of each piece: the softly curved profile of a vase, the gentle fade between two glazes, or the texture of a carved line. These small details make my handmade pottery enjoyable to hold and use. I have been an artist my entire life. At times I have tried to suppress it, but it always rears it’s head and I fall down some sort of creative path. I have a BFA from Emily Carr University of Art and Design where I studied drawing. While I was at university, I never considered touching clay. A few years after I graduated, I decided to take an intro to clay class at a community centre. I was completely enchanted. Clay was all I could think about. I would dream about glaze combinations and shapes. It seemed like a waste of my time to do anything except make pottery; I quit my job in the summer of 2018 and I have been making pots everyday since. I love to spend time outdoors. There is always something new and intriguing to see outside, whether it is a fern, a pile of bricks, or a bird. I’m a person who is continually picking up and examining rocks. Pottery is an organic medium; everything is made from minerals and by checking out my surroundings I can find loads of inspiration and insight to use in my creative process. On a personal level, I don’t feel like a risk taker. But when I have an idea or something needs to get done, I certainly will go out of my way to do it. I am interested in collaborating with any local restaurants or cafes that would like to have handmade dishes. A larger scale project such as that would give me a great sense of accomplishment. Also, I am not much of a cook so seeing my tableware put to good use would be a dream! Starting in May, I will be teaching a monthly hand building worksop at my studio space, Slice of Life. It will be a two-hour tutorial on basic techniques and participants will be able to create whatever they please. Most pottery classes require quite a bit of commitment which simply doesn’t work for many people’s busy schedules. I am looking forward to offering these single session workshops and sharing my love of clay with people who are interested in trying it out. I hope to start offering one on one wheel throwing lessons in the near future as well. Digging and experimenting with wild local clays is a project that is high on my list for summertime. I will be selling my pots throughout the year at different markets around town and will be doing webstore updates every two months. My ceramics will be featured in a couple of art galleries this autumn, which is a very exciting opportunity.